Review: Christopher Robin, rediscovers his enthusiasm for life after a bear named Winnie-the-Pooh, his childhood friend comes looking for him. Did we really need another Christopher Robin film? I found that this was cashing in too much on the Goodbye Christopher Robin, 2017 film. There were too many scenes that were used in this which I found too similar to Goodbye Christopher Robin. There was nothing new or original that we hadn’t already seen. 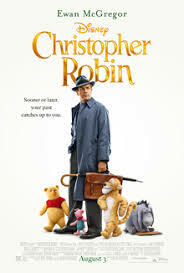 I found it a bit on the disturbing side that Christopher Robin was able to have a conversation with the characters. I am also not sure who the target audience is for this film. It is a bit too mature for children although I can’t see adults engaging with this. The one thing I was impressed with was how beautifully the characters have been animated. This film was denied release in China, as the Chinese citizens have drawn comparisons between Winnie the Pooh and Chinese leader Xi Jinping since mid 2017. The actor, Tristan Sturrock who plays Christopher Robin’s father is the real life Dad of Bronte Carmichael who plays Madeline Christopher Robin’s daughter. Tristan Sturrock also plays Zacky Martin in Poldark (T.V. Series 2015-2019.)!! Gemma Arterton was considered to play Christopher Robin’s wife Evelyn. However she later decided that the role wasn’t for her. I think she made the right decision!! All three actors Toby Jones (Owl), Mackenzie Crook (Newspaper seller), and Simon Farnaby (Taxi driver) appeared in the TV series “Detectorists” (2014) together. Marc Forster and Toby Jones both worked together on the fantastic Finding Neverland, 2004.